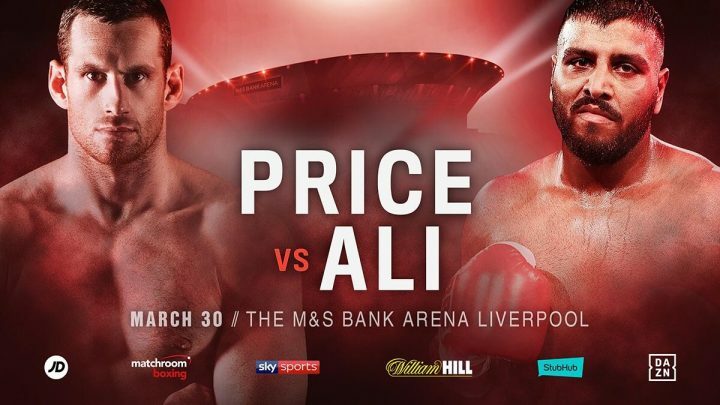 By Trevor McIntyre: David Price (23-6, 16 KOs) will be fighting his former sparring partner Kash Ali (15-0, 7 KOs) in a 10 round heavyweight fight this Saturday night on Sky / DAZN on the Liam Smith vs. Sam Eggington undercard at the Echo Arena in Liverpool, England. A loss for Price against Kash Ali is going to be huge defeat for him, and a sign that it might be time for him to hang up the gloves. A loss to Ali is one that Price can’t blame on his management matching him too tough. Price has got to be able to beat fighters at this level for him to have a shot at fighting the top tier guys like Dominic Breazeale. Price, 35, is hoping that a victory over Kash will get him a phone for a bigger fight. He sees Dominic Breazeale (20-1, 18 KOs) getting a title shot against WBC heavyweight champion Deontay Wilder on May 18, and he feels that he’s a better fighter than the 2012 U.S Olympian Breazeale. In Price’s mind, the only reason Breazeale is where he is today is because he’s skillfully managed better than he has. So instead of Breazeale suffering losses to different guys, he’s gotten a title shot against Anthony Joshua already, and now he’s about to get another world title fight against Wilder next May. “I look at Breazeale and when I watch him I don’t see anything that’s worth worrying about in the slightest,” Price said to skysports.com. “The difference between me and him is the way that he’s been guided to such a position, as he’s on the verge of challenging for another heavyweight title. That’s what you call brilliant management. He’s someone who’s never really impressed me, but you look at his record and he’s only lost once and he’s about to go into a fight with Wilder, after already fighting Joshua. He’s someone I’d be confident of beating…but I’m not in any sort of position to be asking for that fight at this moment,” Price said. Price appears to be taking a shot at his own management by talking about how skillfully Breazeale was brought along. Breazeale clearly has been put in with a lot of beatable guys, but he’s also gotten passed some decent fighters along the way like Eric Molina, Amir Mansour, Izuagbe Ugonoh, Yasmany Consuegra, Carlos Negron, Devin Vargas, Epifanio Mendoza, Lenroy Thomas, Nagy Aguilera, Fred Kassi and Victor Bisbal. Those are good fighters. Whether Price could beat all of those guys is unknown. Certainly Ugonoh, Molina, and Mansour would be hard fights for Price. In the main event on the Sky card at the Echo Arena on Saturday, former WBO junior middleweight champion Liam ‘Beefy’ Smith (26-2-1, 14 KOs) will be facing domestic level fighter Sam Eggington (24-5, 15 KOs) in a 12 round dust up. There’s nothing on the line for this fight. This is just a good old fashioned fight between two guys looking to take each other’s heads off. This should be a fairly easy win for Smith, 30, is coming off of a 12 round unanimous decision defeat at the hands of World Boxing Organization 154 lb champion Jaime Munguia (32-0, 26 KOs) last July in Las Vegas, Nevada. Smith was competitive early on, but the 22-year-old Munguia increased the pace of the fight, and wore Smith down in winning by the scores 116-111, 119-109 and 117-110. This is a fight that could end early if Smith sits down on his shots. Eggington was stopped in the second round by Hassan Mwakinyo last September. Smith is arguably a far more talented fighter than Mwakinyo. Also on the card is EBU light welterweight champion Joe Hughes (17-3-1, 7 KOs) taking on British light welterweight champion Robbie Davies Jr. (17-1, 12 KOs). This should be an interesting fight. Commonwealth light welterweight champion Philip Bowes (19-3, 3 KOs) will be fighting Tom Farrell (16-1, 5 KOs).